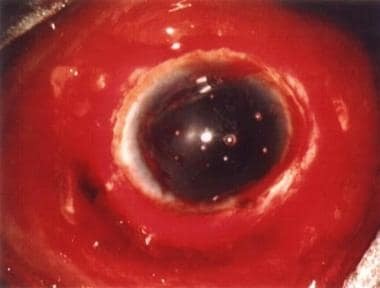 Globe rupture occurs when the integrity of the outer membranes of the eye is disrupted by blunt or penetrating trauma. Any full-thickness injury to the cornea, sclera, or both is considered an open globe injury and is approached in the same manner in the acute setting. Globe rupture is an ophthalmologic emergency and requires definitive management by an ophthalmologist. Although the globe's position within the orbit protects it from injury in many situations, damage to the posterior segment of the eye is associated with a very high frequency of permanent visual loss. Prompt recognition and ophthalmologic intervention are essential to maximizing functional outcome. Globe rupture secondary to trauma is shown in the image below. Operating microscope view of a globe rupture secondary to blunt trauma by a fist. Notice the dark arc in the bottom of the photo representing the ciliary body visible through the scleral breach. Subconjunctival hemorrhage of this severity should raise suspicion of occult globe rupture. Photo courtesy of Brian C Mulrooney, MD. Globe rupture may occur when a blunt object impacts the orbit, compressing the globe along the anterior-posterior axis causing an elevation in intraocular pressure to a point that the sclera tears. Ruptures from blunt trauma are most common at the sites where the sclera is thinnest, at the insertions of the extraocular muscles, at the limbus, and at the site of previous intraocular surgery. [1, 2] Sharp objects or those traveling at high velocity may perforate the globe directly. Small foreign bodies may penetrate the eye and remain within the globe. The possibility of globe rupture should be considered and ruled out during the evaluation of all blunt and penetrating orbital traumas as well as in all cases involving high-speed projectiles with potential for ocular penetration. More than 2 million eye injuries occur in the United States annually, with more than 40,000 resulting in some degree of permanent visual impairment. Trauma to the eye represents approximately 3% of all ED visits in the United States. One third of all cases of childhood blindness result from ocular trauma. No racial predilection exists for globe rupture. A high percentage of globe rupture occurrences are in adolescent boys. The prognosis depends largely on the extent of injury and the time from injury until appropriate surgical treatment. In a study by Lee et al, the charts of 62 patients aged 16 years and younger who had been treated for open globe injuries were reviewed. In addition to location and extent of injury, unfavorable outcomes were also related to the initial presentation of hyphema, vitreous hemorrhage, retinal detachment, cornea wound across the pupil, and endophthalmitis. The prognosis should be guarded until after surgical evaluation. For patient education resources, see the Eye and Vision Center, as well as Subconjunctival Hemorrhage (Bleeding in Eye). Sharma R, Brunette DD. Ophthalmology. Marx, ed. Rosen's Emergency Medicine. 7th ed. 2009. Vol 2: Chap 69. Olitsky S, Hug D, Smith L. Injuries to the eye. Kliegman R, ed. Nelson Textbook of Pediatrics. 18th ed. 2007. Chap 634. Bord SP, Linden J. Trauma to the globe and orbit. Emerg Med Clin North Am. 2008 Feb. 26(1):97-123, vi-vii. [Medline]. Rubasmen PE. Posterior segment ocular trauma. Yanoff M, Duker J, eds. Ophthalmology. 3rd ed. 2008. 6.42. Esmaeli B, Elner SG, Schork MA, Elner VM. Visual outcome and ocular survival after penetrating trauma. A clinicopathologic study. Ophthalmology. 1995 Mar. 102(3):393-400. [Medline]. Koo L, Kapadia MK, Singh RP, Sheridan R, Hatton MP. Gender differences in etiology and outcome of open globe injuries. J Trauma. 2005 Jul. 59(1):175-8. [Medline]. Lee CH, Lee L, Kao LY, Lin KK, Yang ML. Prognostic indicators of open globe injuries in children. Am J Emerg Med. 2009 Jun. 27(5):530-5. [Medline]. Rodriguez JO, Lavina AM, Agarwal A. Prevention and treatment of common eye injuries in sports. Am Fam Physician. 2003 Apr 1. 67(7):1481-8. [Medline]. Listman DA. Paintball injuries in children: more than meets the eye. Pediatrics. 2004 Jan. 113(1 Pt 1):e15-8. [Medline]. Harlan JB Jr, Pieramici DJ. Evaluation of patients with ocular trauma. Ophthalmol Clin North Am. 2002 Jun. 15(2):153-61. [Medline]. Arey ML, Mootha VV, Whittemore AR, Chason DP, Blomquist PH. Computed tomography in the diagnosis of occult open-globe injuries. Ophthalmology. 2007 Aug. 114(8):1448-52. [Medline]. Hoffstetter P, Schreyer AG, Schreyer CI, et al. Multidetector CT (MD-CT) in the Diagnosis of Uncertain Open Globe Injuries. Rofo. 2009 Oct 26. [Medline]. Essex RW, Yi Q, Charles PG, Allen PJ. Post-traumatic endophthalmitis. Ophthalmology. 2004 Nov. 111(11):2015-22. [Medline]. Vachon CA, Warner DO, Bacon DR. Succinylcholine and the open globe. Tracing the teaching. Anesthesiology. 2003 Jul. 99(1):220-3. [Medline]. Libonati MM, Leahy JJ, Ellison N. The use of succinylcholine in open eye surgery. Anesthesiology. May 1985. 62:637-639. [Medline]. Augsburger J, Asbury T. Ocular & orbital trauma. Rioodan-Eva P, Whitcher JP, eds. Vaughan & Asbury's General Ophthalmology. 17th ed. 2007. Chap 19. Yuan WH, Hsu HC, Cheng HC, Guo WY, Teng MM, Chen SJ, et al. CT of globe rupture: analysis and frequency of findings. AJR Am J Roentgenol. 2014 May. 202 (5):1100-7. [Medline]. The authors and editors of Medscape Reference gratefully acknowledge the contributions of previous authors, Joe Robson, MD, Amy J Behrman, MD, and Stephanie Abbuhl, MD, to the development and writing of this article.